Clackamas Soil and Water Conservation District invites you to join us for an evening with author Don Stuart. Don has spent his career working with such groups as the American Farmland Trust, Washington Association of Conservation Districts, and commercial fishing associations. Although he is an attorney by trade, Don holds a deep passion for collaboration, farming, and the environment. His goal is to promote empathy between farmers and environmentalists to further conservation activities and the economic viability of both groups. 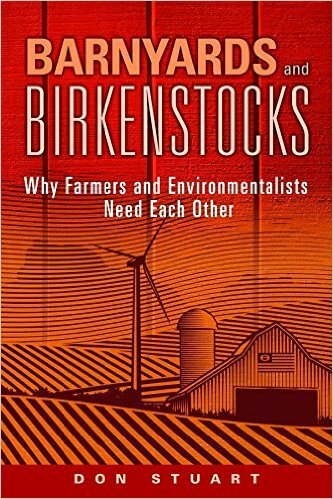 We are excited to have the opportunity to host Don at our Beavercreek Demonstration Farm to talk about his latest book Barnyards and Birkenstocks: Why Farmers and Environmentalists Need Each Other. Our venue only holds 60 folks, so if you are interested in attending, please click on this link (Barnyards and Birkenstocks) to reserve your seat. Drawings for free copies of Barnyards and Birkenstocks will be held over the course of the evening. This is a FREE event! We just need to be able to cut off the attendance at 60. We hope to see you there! For additional information, please call 503-210-6000.